Midi and Audio track seamless sequencing (client own arrangements or own custom work) using the latest professional computer (DAW) systems and software. below describes these options in summary, customers are however always welcome to submit special requirements . QUALITY Quality work is the key to success in todays' competitive industry. As producers with a reputation to live up to we naturally actively pursue perfection in all our clients work. You should thus expect no less than the best value for money , and should at anytime a problem arises, we will ensure our clients get satisfactory solutions. We routinely retain qualified resident engineers (minimum UK BTEC Music Technology or above) who further boast of years' experience in music productions and are talented musicians themselves, hence understand perfectly all challenges that artists and clients may face. Analogue production setup Traditionally the purest mode for audio recording, 'analogue' is made using tape multitrack machines, availed to clients at Soundworks Studios, Blackbird leys Oxford. Also major works requiring larger scale recording or mixing e.g. choir/orchestra can be tranfered to the larger Soundworks facilities. A full breadth of pro analogue hardware (e.g 48 track Allen and Heath valve mixing console, TL Audio outboard, etc, will be at hand. Click picture to enlarge studio photo. 'Analogue' production setup - SOUNDWORKS OXFORD. Regarded as the purest mode for audio recording, 'analogue' can be made using ADAT multitrack machines, availed to clients at Soundworks Studios, Blackbird leys Oxford. Of course , the newer digital format is always available in tandem. 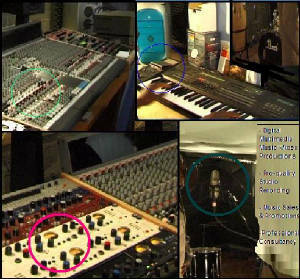 Major works requiring larger scale recording or mixing e.g. choir/orchestra can be transfered to the larger Soundworks facilities. A full breadth of pro analogue hardware (e.g 48 track Allen and Heath valve mixing console, TL Audio outboard, etc, will be at hand. Click picture to enlarge studio photo. A set of Intel processor Dual Core PCs equipped with top brand soundcards Yamaha, Emu, M-Audio and running a variety of Digital Audio Workstation (DAW) and Midi Production software, are at the core of the system. The system software suite includes top calibre synthesiser instruments accompaniment in traditional GM XG GS or other exotic formats, plus seamless Audio+ Midi sequencing and multi-track recording via Logic Pro, Samplitude Pro, Cubase Pro, Powertacks Pro Audio software, and advanced digital DSP, mixing and mastering all in the one package. Monitors range from Hi-fi to studio reference grade units M-Audio, Tannoy, Yamaha to fully cover all possibilities. Almost all traxbox instrumentation is produced here except for specific acoustic recorded items, live drums, wind instruments and vocals, for instance, which are handled at our sister studio Soundworks oxford. In each case above, starting with bare vocal samples (here royalty-free items from MAGIX), we duly determine and develop an appropriate basic accompaniment, incorporating basic arrangement of beats, instruments and the vocals.. Digital-Analogue DSP enhancement including filtering , Eq as well as effects, both in real time or off-line are also applied. The samples are then mixed down to two stereo tracks as appear in the demos. A more or less similar approach is used to produce complete and more complex music for clients. 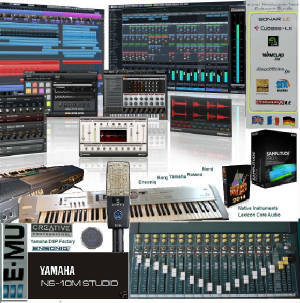 XG/AW2, Roland GS/GM, Korg Triton, up to Magix Robota, E-Jay, Native Instruments , etc. pro, etc. Pentium high performance PCs. YAMAHA DSP FACTORY (DS2416 , SW1000XG PCI Cards) . Software DSP processing Pro-quality on-board by Steinberg, Yamaha,Edimol, etc AND various. Yamaha NS10M, HS80M Studio Monitors, JBL, KROK. Portable recording and sound production units and the expertise to use them. Pro-series high quality mixing console, upto 48 audio channels: Behringer, Yamaha, Allen and Heath. CD/MD/tape mastering ,duplication and jacket design suites Marantz, Tascam, DAW based.